Tuesday brings a new review to SuperPhillip Central. LEGO City Undercover scored well back in the early Wii U days (and back when SuperPhillip Central used numbered scores). Now we see it return, but this time on even more platforms, including the Wii U's successor, the Switch (which is the version this review is based off of). 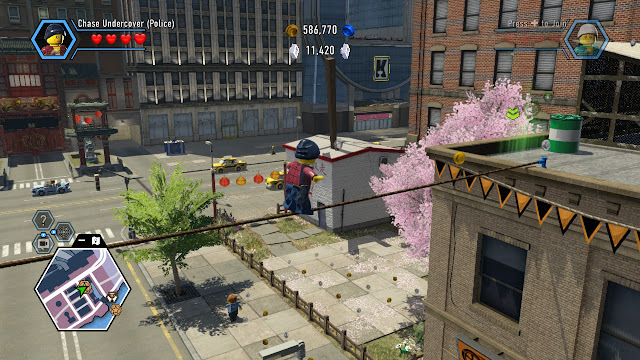 After four years, how has LEGO City fared? UPDATE: Apparently the 479 MB patch for LEGO City Undercover was something I hadn't downloaded or installed. When I did, all of the Nintendo references seen in the Wii U version were available in my Switch save file. 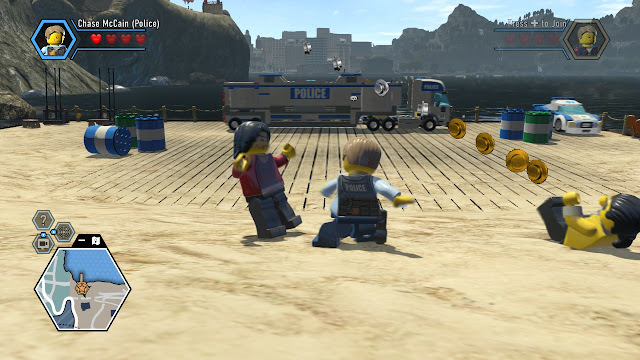 LEGO City Undercover originally released in 2013 for the Wii U. 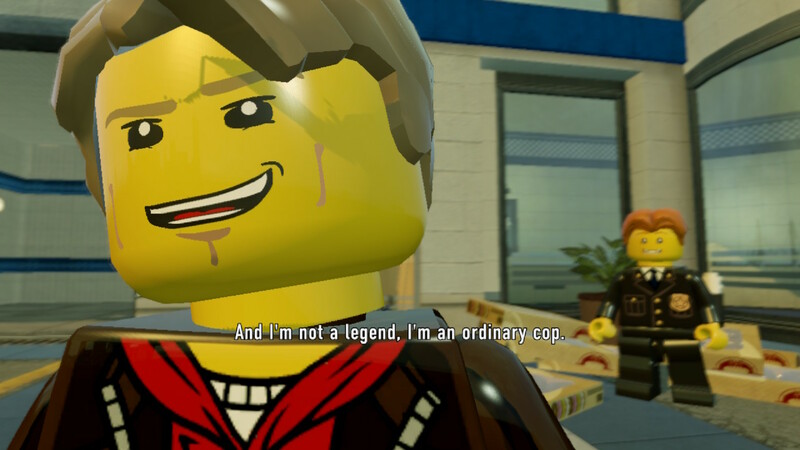 Playing through the funny story, witnessing the sharp writing, and discovering secrets in LEGO City itself made it my personal favorite LEGO game. Now it's 2017 and finally the game gets a chance for even more exposure with a port on the PlayStation 4, Xbox One, PC, and the most recent of hardware releases, the Nintendo Switch (though it lacks the Nintendo references of the Wii U version). Despite all of its problems from its transition between a Wii U exclusive and a multi-platform game, LEGO City Undercover retains a lot of what I enjoyed from back in 2013. LEGO City Undercover sees hero Chase McCain get less than a hero's welcome when he returns to LEGO City. However, crime is in season, and Rex Fury has escaped from Albatross Island. Rejoining the LEGO City Police Department and having a big fan in the hilarious (no, really-- no sarcasm there!) Frank Honey, Chase McCain is back on the case, but with a great deal to prove. 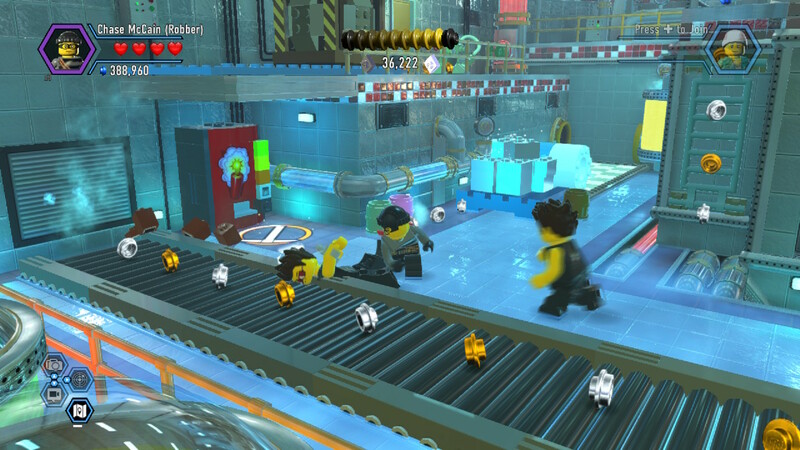 The story shows Chase entering the underbelly and underworld of crime of LEGO City by going undercover. Not just to make up for the mistake that saw him shipped out of LEGO City in the first place, but to make it up for a special someone. Ordinary cop? You're much too modest, Chase! Compared to Frank Honey, you're Robocop! While there are several elements of LEGO City Undercover that are lessened from the Wii U version when compared to these ports, the first thing that doesn't get a hint of degradation quality-wise is the hilarious writing. The characters have sharp dialogue, provide funny slapstick humor and sight gags, and would be enjoyed by folks beyond the usual LEGO game audience. In fact, many of the references in particular to various movies would be lost on kids. From a character named Blue who can "get" things for our hero when he ventures inside Albatross Island as an ode to Shawshank Redemption (complete with "not knowing what that Italian lady was singing about that day" and without the more adult scenarios) to a construction yard foreman who looks and sounds suspiciously similar to a former governator of California. It's quite weird how he slips movie names from that actor's career into his spoken dialogue. In most LEGO games, you get an assortment of characters to switch between, each with different powers and abilities used to solve puzzles and platforming challenges. LEGO City Undercover takes the concept of different powers and abilities but splits them between the various disguises that Chase can wear. Each disguise is earned from playing through the story normally, generally in the game's missions, and each has its own uses. The robber disguise, for instance, is the only one that can crack safes and pry locked doors open, while the miner is the only disguise of Chase's that can pick up dynamite to be used to blow up silver structures and doors. While not his only trick, Chase in his LCPD attire can grapple onto hooks like this one. 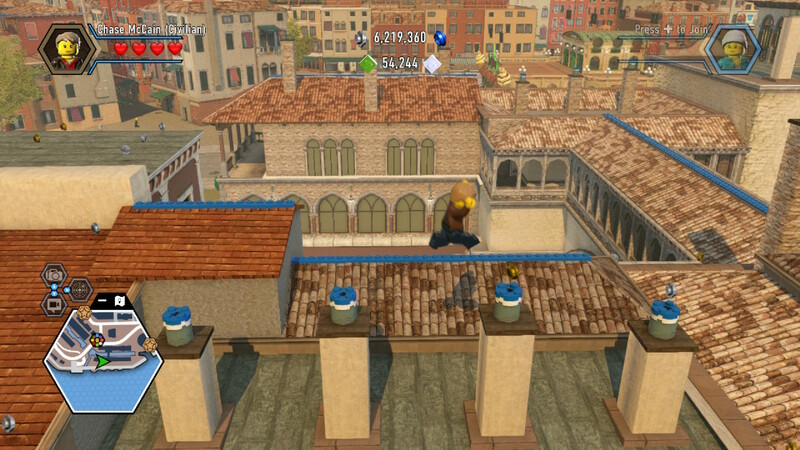 Speaking of the missions in LEGO City Undercover, there are the typical LEGO game missions that take place in closed off areas where the goal is to basically punch everything in sight, build objects from the destroyed LEGOs in a sometimes set order, and solve simplistic puzzles this way. Other times in LEGO City Undercover you're doing stuff outside the confines of traditional LEGO game levels, stealing a vehicle and trying to get to another part of the map in one piece, saving someone from the rooftop of a burning hospital building by doing some jumping, climbing, and parkour-like maneuvers (this is while taking out baddies along the way), and other miscellaneous mission types. Chase McCain in his robber disguise put these gang members on ice. Failure in combat or in a level never results in a hefty price. If Chase takes too much damage, falls into an out-of-bounds area, and such, he merely gets brought back to life with a soft LEGO stud penalty (the currency used to buy things in the LEGO series). Failing a mission at any time merely means you start over from that current segment. So if you crashed your vehicle by flipping it upside-down-- which is something that is very possible due to the jerky driving and handling involved-- you don't have to curse much as you'll just restart from the beginning of the road trip. Well, at least with the driving in this game you won't be stuck on the tutorial. LEGO City is a sprawling metropolis with multiple regions and areas to it. You have its Cherry Tree Hills that is reminiscent of San Francisco with its streetcar, houses on hilly streets, and its own version of the city's famous Lombard Street (the super-curvy road with a multitude of hairpins). Then, there's its Bright Lights Plaza, obviously modeled after New York City's Times Square. LEGO City doesn't just stick with United States of America cities either, as one east coast part of town is an ode to Venice in the form of Fresco. It's really best to wait to explore the insides and outsides of LEGO City until you have beaten the game's 10-15 hour campaign. That way you have all of Chase's disguises available to him. 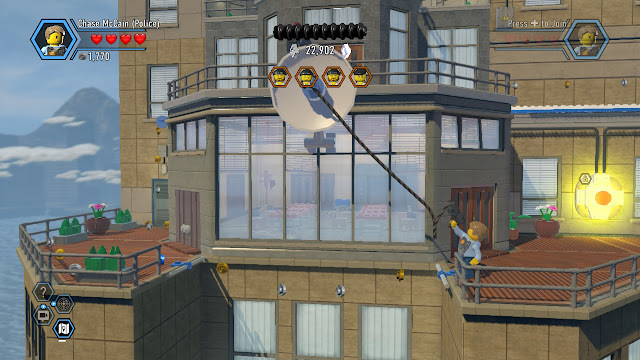 There's no greater annoyance in an open-world LEGO game than making your way from street level all the way to a building's rooftop only to find that you don't have the necessary disguise needed to complete a given extra side task. Chase doesn't need a workout regimen. He gets enough exercise from exploring LEGO City. And LEGO City is filled to the brim with these extra side tasks. There are activities that are related to the various disguises, such as putting out specific fires as the fireman, watering specially marked plant boxes as the farmer, planting a flag atop a building as the astronaut, and so forth. However, there are also other side tasks that don't involve a specific disguise. 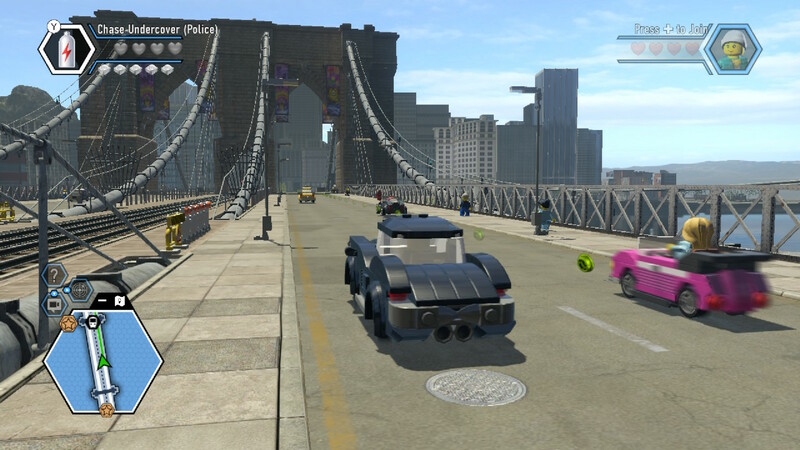 These range from discovering criminals in the act with Chase's scanner (no longer needing a separate screen to utilize like with the Wii U version using its system's GamePad) to getting in a particular vehicle to begin a time trial, where the goal is to go through marker to marker before time runs out. to reach the perfect spot to spy on some do-badders. It can seem a bit overwhelming as there is a LOT of collecting to do. When I say collecting, I mean collecting gold bricks (one is given for each side task completed in a given LEGO City region), red bricks (which unlock cheats), character tokens, vehicle tokens, and super bricks that are the currency used to build impressive feats of construction with Super Builds. There are 450 gold bricks in total to collect for 100% completion, so even when you beat the initial campaign, you can easily double the 10-15 hours of play time considerably, perhaps even triple it. 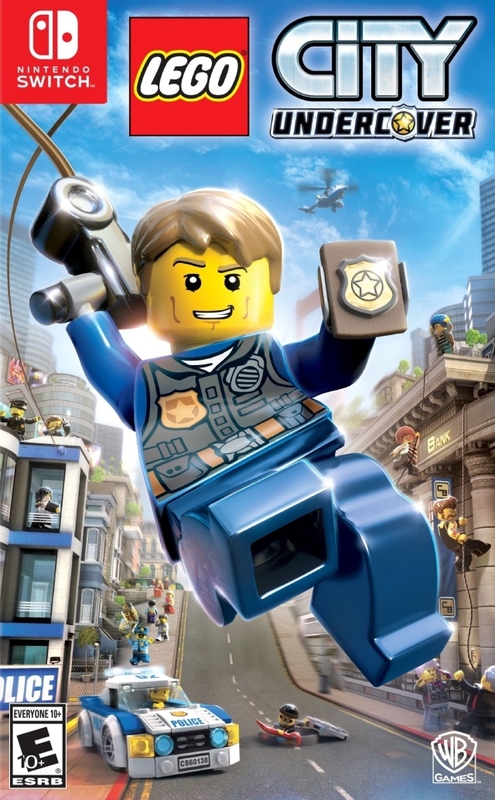 Combat is like the heel of Achilles, a weak part of LEGO City Undercover. Unfortunately, LEGO City Undercover on Nintendo Switch seems to be a bit of a cheaply done port, if the tagline of this review didn't reveal that already. Game crashes have happened on three occasions, where an error message presented itself and sent me back to the Switch main menu. Thankfully, after every side task completed, special item collected, or story segment completed, the game automatically saves, so seldom did I lose much progress or any at all. Less annoying but still obnoxious are the times when the main audio just gave out. Neither voices nor music would play, and subtitles were sped up during these problematic occurrences as well. The only solution was to close the software and load the game back up. I recall freezing and hard crashes being issues in the Wii U original, so it's disappointing these haven't been rectified in the Switch re-release. I don't, however, remember the music and voices cutting out the way they do in this port. Forget it, Chase. It's Chinatow-- I mean, Pagoda. 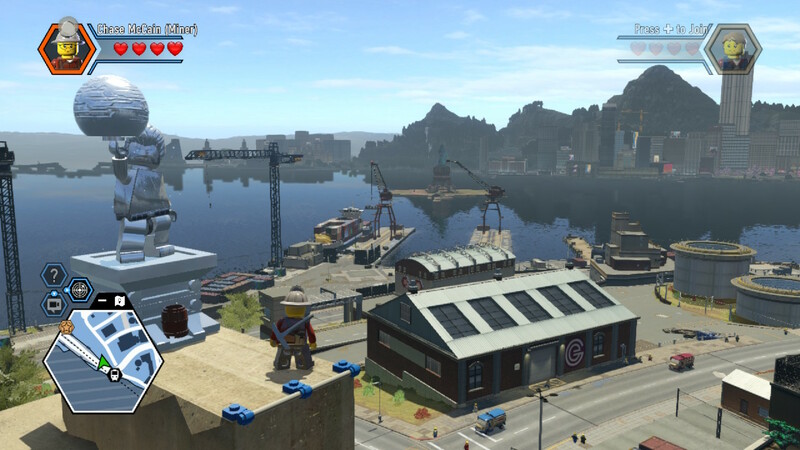 In the Wii U version, the map of LEGO City was located on the GamePad screen. 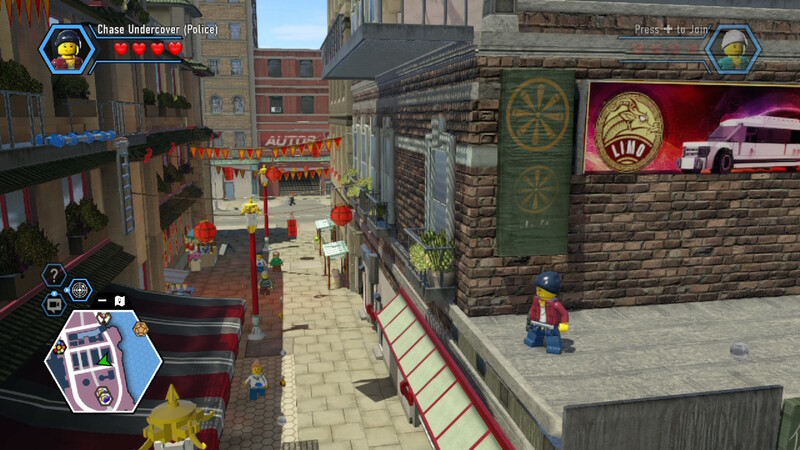 In these updated ports of LEGO City Undercover, the map is located in the bottom left corner of the [obviously TV] screen. There are two problems here: 1) Sometimes the map doesn't center on where Chase currently is, focusing on something entirely different, and 2) The game does not pause when you bring up the map with the Select/Minus button. You can see this while driving and bringing up the map. Chase's vehicle will slow to a stop. Finally, if these bundles of joy that are the technical problems of LEGO City Undercover's new gen ports aren't delivering enough fun for you, the loading times from the Wii U version are better, but only slightly so. That said, it's much more entertaining to read tips from Frank Honey and Chief Dunby than stare at a progress bar (no matter how funky the music that played during these loading screens were). For the Nintendo Switch version specifically, there is quite a bit of slowdown and frame-rate chugging in handheld mode. Docked is much more stable, though also having occasional issues in performance. Things like draw distance of buildings and such in the background is good, but people and vehicles materialize in and out. Audio wise, the music is as stellar as ever, offering a '70s cop show-like score, and the voice work is wonderful and delightful. The only real issue is in scanning mode and how picked up conversations sound incredibly loud compared to everything else. The draw distance isn't too shabby in the Switch build of LEGO City Undercover. Overall, I had an enjoyable second trip to LEGO City (well, third technically because of the 3DS prequel). It says a lot that even with all of the problems of these ports (both new in these versions and ones that weren't really fixed from the Wii U original) that I found myself having fun exploring the city, following along with the story, and losing dozens of hours to the game. It's just a total shame that this feels, looks, and plays like a quick and dirty port when LEGO City Undercover deserves so much more.